JW Marriott Hotels & Resorts is pleased to announce the launch of CUR8, an experience-oriented app that allows guests to share their favorite travel moments through digital videos on their personal social media networks. 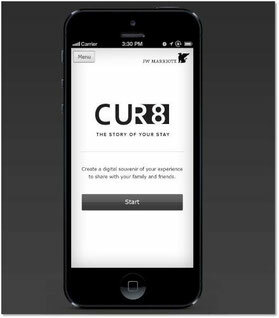 CUR8 is JW Marriott's debut into the mobile space and is one of the first apps developed by a hotel brand that focuses on reaching travelers on a personal level by giving guests a platform to showcase their own exceptional experiences with loved ones while on the road. The app is user-friendly and features six easy steps to help guests share moments in minutes. Guests can use CUR8 to create digital souvenirs through a combination of their own personal videos and photos and selecting from a bank of striking JW Marriott property images. App users also have the option to set their videos to music and add text featuring personalized messages to their short films. CUR8 was created and designed by Los Angeles-based advertising agency, Team One. "With hotel-branded apps becoming more mainstream, we wanted to make our entrance into the tech landscape with a product that allows guests to capture memories from their stay," said Mitzi Gaskins, vice president and global brand manager of JW Marriott Hotels & Resorts. "We know that social media is important to our guests so we created a lifestyle app that offers an innovative and convenient way for them to share their travel experiences." From capturing a stunning island sunset over the Andaman Sea at JW Marriott Phuket Resort & Spa to chronicling your exploration of the historic Inca Empire ruins while at JW Marriott Cusco, CUR8 will feature content from all 64 JW Marriott Hotels worldwide so guests can utilize idyllic property images from around the globe within their videos. "Travel and storytelling go hand-in-hand, and with CUR8, our guests are able to seamlessly integrate the two in a way that is approachable and aligns with their own interests in technology," said Jim McMahon, senior manager of brand marketing for JW Marriott. "Our properties offer incredible experiences in amazing destinations around the world that are worth sharing. This new app allows travelers to tell these stories from their own personal lens in a modern and meaningful way." Travelers can share their curated videos with loved ones via Facebook, Twitter and YouTube using hashtag #CUR8byJWM. CUR8 is free of charge and currently available for download through the iTunes store.